Powell Mountain Cellars, a unique brand producing extraordinary wines exemplifying varietal character, and sense of place. Enter Paso Robles, an area synonymous with wine lifestyle. Imagine old California, a time where the pace of life was slower. Here you will find pastoral beauty, a mountainous landscape of rolling ranch and farm land among old oaks. Golden hills where vineyards thrive and people smile as they share the rewards of their tenure with unique people like you. Wine lovers that appreciate handcrafted wines produced by meticulous winemakers and farmers who work together taking pride in honing their craft. 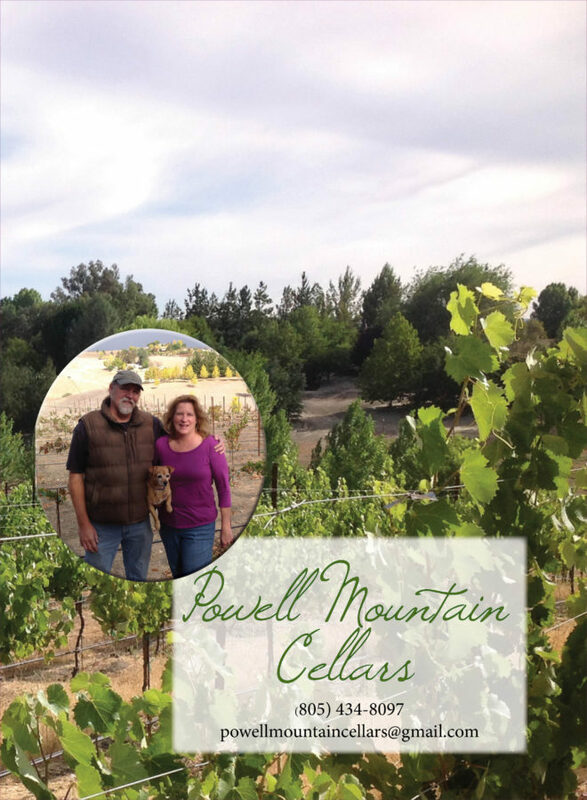 Winemaker Bill Powell and wife Kim Powell established Powell Mountain Cellars in the fall of 2010. Bill set a goal to produce exceptional world class wines from the Paso Robles appellation. A place we call home. Having relocated to Paso Robles, we have now planted several acres of estate grapes on our ranch located in San Miguel, CA. We were excited to release are first commercial vintage in 2010 as it was a remarkable year and the wines taste wonderful! Bill spent many years in Southern California studying viticulture, fermentation science, winemaking practices, and planted a small vineyard of Rhone varietals. He primarily focused on perfecting individual varietals and blends from Rhone and Bordeaux grape varietals from many viticulture areas of California. He has handcrafted many wonderful wines. Today, at Powell Mountain Cellars he has developed his own unique style creating wines from these same varietals that are both elegant and bold, and concentrated in flavor. To insure our wine is of the highest quality, all of the wines are hand crafted and fermented in small lots. Wine grapes are picked from low yielding vineyards at peak of maturity, for optimum balance, color, and flavors that are delicious and intense. Each white grape varietal is pressed then fermented in stainless steel tank, or in oak surlie style. The wine is then clarified and aged in oak barrel or tank. Each red grape varietal is de-stemmed, cold soaked, and fermented on skins an average of three weeks. The wines are then pressed and barrel aged for up to three years. We bottle each varietal or blended wine when we believe it is ready for you to drink. “No wine before it time”. So please be patient as future releases become available. The Powell’s have gone from making a few barrels for family and friends to several barrels and thousands of bottles of our Powell Mountain Cellars wine for your everyday enjoyment. We hope you will treasure and enjoy our wine as we do!